Not long after we first started dating, I began to work on my wife to get her to start reading Fantasy and S/F - she hadn't been much of a fan until then. However, I didn't get a whole lot of traction until they started working on the movies for "The Lord of the Rings", when she finally read "The Hobbit" and LotR. 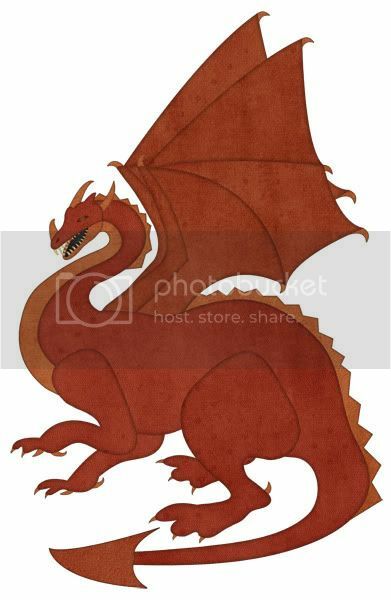 This is all just a preface to say - check out her interpretation of Smaug! I am happy to see DeDe branching out in to the Scifi genre of art. Perhaps she could do a digitalBearz set of scifi stuff. So who was Smaug? Was that Lord Voldemort's snake? See? SEE?!! THIS is why I should be crowned "TrekWest5 Art Critic in Chief". Or was that who Lord Voldemort fought when he fell down the bridge of Khaza-dum? No sorry that was Thulsa Doom he fought.